The Vatican is reportedly upset that Bishop Gene Robinson will be at the White House to greet the Pope. In an open letter, Robinson explains why they shouldn’t be. I pray for you every day, because your pastoral responsibility is so daunting, and even if you are Pope, you are still only human. I have had the opportunity to be chief pastor and bishop to a faithful flock (albeit so very much smaller than yours), and it is an awesome responsibility. It is also a blessing and an honor to serve, is it not? There has been a bit of a kerfuffle in the last 24 hours due to reports that a senior Vatican official is offended, on your behalf, by my invitation to the White House on Wednesday to welcome you to America. Sister Simone Campbell, one of the nuns working day in and day out on behalf of the poor, is lumped in with me as a purported offense to you. Based on your saintly ministry so far as Pope, I have to suspect that this report does not represent your own views (if this has even been brought to your attention), but rather the views of those who would try to “protect” you from the world. It would seem that I hold a higher view of you than some of your handlers who may have forgotten that you have demonstrated quite regularly not only your knowledge of the real world, but also a compassion for it. Not to mention that the good nun and I will be somewhere in the middle of a throng of 10,000+ Americans joining together to welcome you and wish you well. I suppose the Vatican official’s concern has to do with my having been elected and consecrated a Bishop of The Episcopal Church, while at the same time being an openly gay, partnered man. 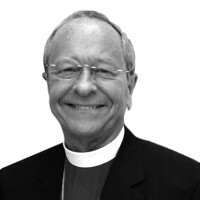 Were I ever to have the honor of meeting you, I would of course not be the first gay man or gay bishop with whom you have had contact. Some of them, undoubtedly, work with and for you in the Vatican. Based on your demonstrated and notorious compassion, I suspect you will not be offended by a gay bishop and a feisty nun somewhere in the crowd of 10,000 admirers. We disagree in our understandings about sexuality and the diverse and wonderful ways God has made us. But as far as I am concerned, that does not keep me from admiring you and praying for you and your ministry. Our churches disagree on those whom we are willing to ordain, their gender and their sexual orientation. Still, that does not keep me from striving to love and serve those entrusted to me, and to pray for you as you strive to love and serve those entrusted to you. We both care passionately about the poor, and we share the notion that unfettered capitalism creates and perpetuates poverty, treating the less fortunate as goods to be used up and discarded. You and I believe that God has a special place in God’s heart for those who are marginalized—whether they be refugees, undocumented immigrants, those living with HIV/AIDS, or those without food, shelter and healthcare. And we both suspect that God must wonder when we are going to find the courage to love and care for our beautiful and fragile planet. We have so much that binds us together, and so little that separates us. We are probably never going to settle those differences. As for me, I am willing to acknowledge the saintly integrity with which you hold your views, even if I disagree with them, as I hope you might acknowledge my striving for integrity in mine. It seems that in these times, the greatest sin would be to write one another off and to stop caring about one another. That, I think, would break God’s heart. Something tells me that you will not be offended if I am somewhere in the crowd of 10,000, gathered to welcome you to America, with respect and wholehearted affection. And I doubt that you need your colleagues in the Vatican to be so protective of you. We believe, you and I, that God loved us so much, God chose to become one of us, flesh and blood, incarnate. And that incarnation continues to raise humankind to new heights and calls us to serve all of God’s children. I will be somewhere in that throng of people on the south lawn of the White House, welcoming you to America, and listening intently for what godly wisdom you might impart to us. Thank you for visiting us in America. And while members of your own flock will have a special joy in your visit, please know that many more of us respect your office and love you as a human being.